Carmel-by-the-Sea is among the most charming small towns in California, remaining so, even under the pressure of tourism. The primary attraction here is shopping, and Carmel streets are lined with galleries and shops of all descriptions. Even if you're only window-shopping, a stroll downtown can be very pleasant, and if you wander along the side streets, you'll find some lovely hidden courtyards and gardens to explore. In fact, Carmel is so charming that it makes a perfect place for a weekend getaway. You'll find a couple of excellent, easily accessible beaches in Carmel. Just south of town off Highway One, Carmel River State Beach offers a beautiful place to watch the sunset. In town, Carmel Beach at the end of Ocean Avenue has a lovely stretch of white sand that's fun for a walk, sunbathing or people watching. Downtown Carmel's Ocean Avenue is lined with shops and charming art galleries to browse through. They're easy to find, and all you have to do is walk down the street. You can also venture off onto the side streets to find boutique shops and small garden courtyards and passageways like the tiny, bamboo-lined passageway that connects Dolores Street to San Carlos Street or Mission Lane just off Mission Street between 5th and 6th Avenues. Follow these directions for a short trip with great views—you'll have a tough time deciding whether to gawk at the ocean views or stare at the gorgeous homes you'll pass along the way. From downtown Carmel, take Ocean Avenue toward the beach. 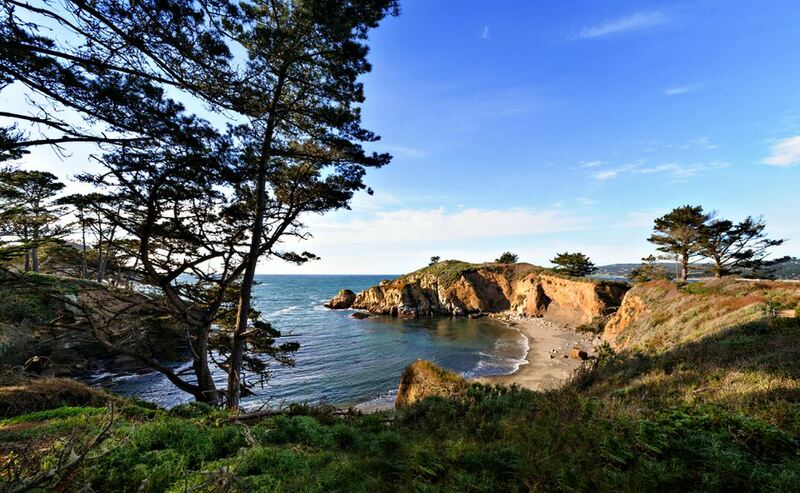 Turn left onto Scenic Road and follow it along the water's edge to Carmel River State Beach. At the beach, the road changes its name to Carmelo Street. Follow that, and it will lead you back to downtown. You've probably heard of the 17-Mile Drive through Pebble Beach. The famed route passes through an exclusive neighborhood, past scenic beaches, golf courses, and luxury hotels. If you're already in Carmel, look for signs leading to the entrance, which is likely to be less busy than the main gate just off Highway One. If all this small-ish state park just south of town had to offer were some great hikes and a dramatic shoreline rockscape, it would be worth a visit. Add the local wildlife (which includes sea otters and harbor seals), and it becomes almost magical. Mission Ranch serves a tasty Sunday brunch buffet where you can eat while enjoying a pastoral view of sheep grazing and the ocean in the distance. You can't beat their patio on a sunny day, and the live jazz ensemble is top notch. Mission Ranch is also the perfect place for an early evening drink. You can watch the sheep from the patio, and if you're there at the right moment, see them all hustle into their pen just before sunset. It's so cute that they sometimes get a round of applause. But they're not the only performers associated with the property. Actor and director Clint Eastwood is one of its owners. If you enjoy your evening cocktails with a view, head just south of town to the Sunset Lounge at the Highlands Inn about half an hour before sunset. All you have to do after that is settle into one of the seats next to their floor-to-ceiling windows and order your favorite libation. Just outside of downtown Carmel, the Sunset Center for the Performing Arts is a beautiful performing arts venue with a lineup that includes some recognizable names and an eclectic mix of classical music, classic rock, ballet, dance, and stage performance. Given that Carmel is short on things to do in the evening, it's ​worth checking their schedule before you go to see if they have something going on that you'd enjoy. Long known for its art galleries and boutique shops, Carmel is picking up steam as a food and wine destination, with more than half a dozen winery tasting rooms in just four blocks downtown. If you buy a bottle of wine at one of the downtown tasting rooms and want to enjoy it with a meal, some local restaurants will waive their corkage fee. Just off the main drag at Junipero Street and 5th Avenue in downtown Carmel, you'll find The Forge in the Forest. It's open all day, and their patio is dog-friendly, but the best time to go is after dark when it takes on a near-magical, quintessentially California feel. Their food is good, and you can eat outside under one of their overhead heaters in all but the coldest weather. You can also find a seat beside one of the outdoor fireplaces and toast your toes while you enjoy dessert or an after-dinner drink. Carmel is one of the oldest cities in California, tracing its roots to 1770 when Spanish missionary Father Junipero Serra founded Mission San Carlos de Borromeo Carmelo. The mission is located on the south side of town near Mission Ranch. Even if you're not a history buff, you will enjoy the mission's unique architecture and gardens.